After years of slow movement in the hands of inexperienced but determined people from the Philippines' Department of National Defense (DND) and Philippine Navy (PN), an award was finally made for the Frigate Acquisition Program Lot 1 (Platform & Launchers) recently. The project involves the acquisition of 2 frigate platforms, including all necessary equipment and weapon launchers. The only missing component of the frigates are the ammunition comprising the gun ammo, missiles, and torpedoes, which are covered by the project's Lot 2. MaxDefense was the first to report of this milestone last September 1, 2016, and is thankful for the support and patronage of its sources and contributors, community members, readers, and other news aggregation sites. 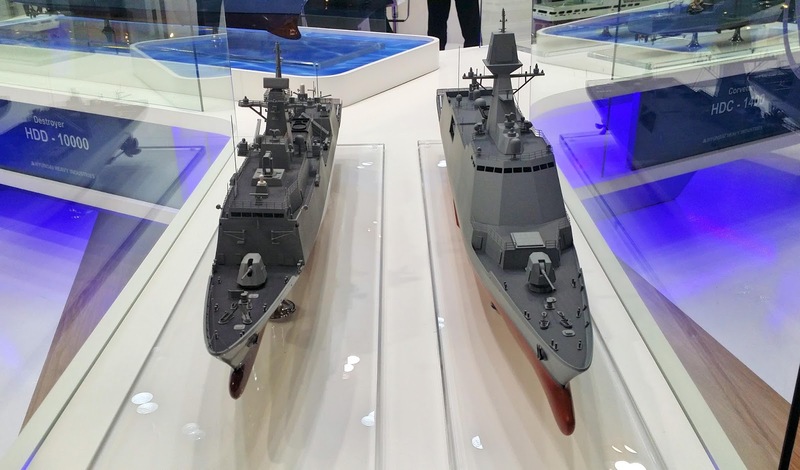 Although MaxDefense has numerous blog entries dedicated on the frigate project, it is better off to create a new one that will now focus more on the winning bidder, South Korea's Hyundai Heavy Industries (HHI), and their offered product. If readers remember the events from around May to July 2016 leading to the awarding of this project, there were two remaining bidders out of the original 6 that passed the Stage 1 of the project bidding, India's Garden Reach Shipbuilders & Engineers Ltd (GRSE) and South Korea's Hyundai Heavy Industries. During the Stage 2 phase of the bidding, GRSE was declared the lowest compliant bidder with a bid amount of Php 15.047 billion, while HHI's bid was the second lowest at Php 15.744 billion, a difference of almost Php 700 million. The bids from Daewoo Shipbuilding & Marine Engineering (DSME) and Navantia were found to be non-compliant, while STX and STX France did not submit a bid. When it seems that GRSE is on the road to winning the project with their offer using the Indian Navy's Kamorta-class large ASW corvette as a base hull, they were post-disqualified by the Project Management Team (PMT) during the Post Qualification Stage after their Net Financial Contracting Capacity (NFCC) was found to be below the requirement based on the guidelines stipulated on the Implementing Rules and Regulations of Government Procurement Refort Act (RA 9184). GRSE tried to correct the problem days after the Post Qualification Stage, but it still did not meet the requirements. To be fair with GRSE, they submitted an eligible document on NFCC during the Stage 2 Submission & Opening of Bid Envelopes (SOBE) last December 2015. Government procurement rules says that in such cases, the PMT is then allowed to conduct Post Qualification inspections on the next lowest compliant bidder, which is HHI. And upon completion of the PQ Stage with HHI last June 2016, they were found to be the compliant and was later on declared as the lowest post-qualified bidder for the project. Copies of the resolution post-disqualifying GRSE can be found on our previous Facebook post at the MaxDefense FB community page. While an award was expected to be made in June 2016, it was decided by no less than former President Benigno Aquino III to give the next administration the respect and honour of re-checking the project details and do the awarding. This is to allow the project avoiding the risk of labelled as a "midnight deal", which could be detrimental to the project's survival. Remember when former Pres. Gloria Arroyo was succeeded by Pres. Aquino in 2010, and cancelled the already awarded Multi Role Vessel (MRV). After vigorous defense and justification made by the Philippine Navy to allow for the project to continue and awarded, Defense Secretary Delfin Lorenzana finally signed the Notice of Award on August 2016. 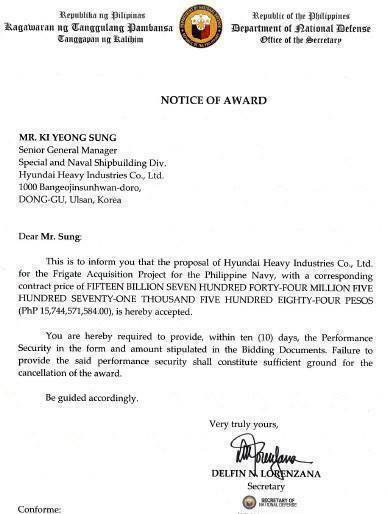 The Notice of Award to Hyundai Heavy Industries, which was signed and awarded this month. Based on MaxDefense's sources, the DND and PN are said to be preparing for the Contract Signing ceremonies with HHI on September 12, 2016. 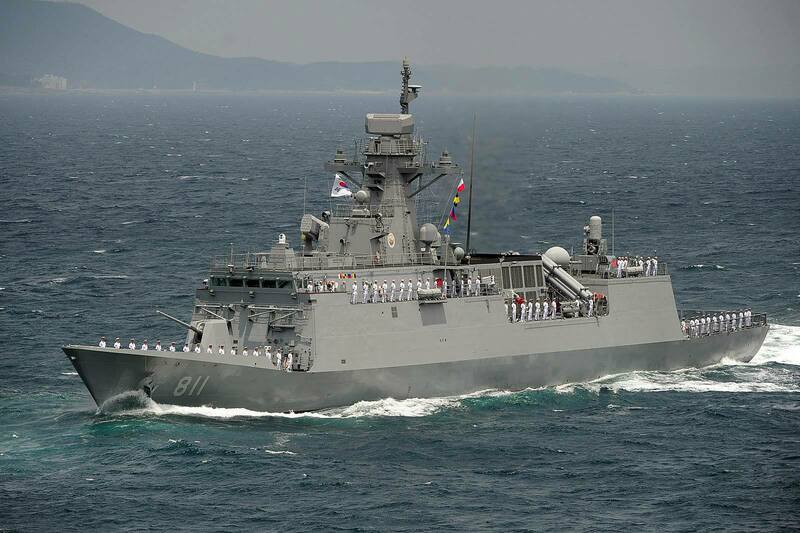 MaxDefense also expects that both Hyundai and the Philippine Navy will showcase the Philippine Navy's future frigate in the upcoming Asian Defence, Security & Crisis Management Exhibition & Conference (ADAS 2016) from September 28 to 30, 2016. For those who were following MaxDefense in its early years, we reported based on information provided by sources that Hyundai Heavy Industries replied to a Request for Proposal from the Philippine Navy, and submitted an offer to supply 2 frigates based on HHI's HDF-3000 frigate design. 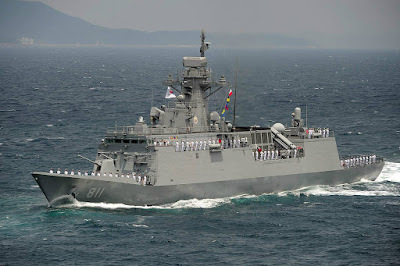 The design is a 3,000-ton full load displacement category frigate, and was adapted by the Republic of Korea Navy (ROKN) for their FFX-1 Project which eventually became the Incheon-class coastal defense frigate. - possible changes in the superstructure design to accommodate PN requirements. Another consideration that needs to be factored-in is HHI's release of a newer design which they call the HDF-3500 frigate, which will be used for the ROKN's FFX-3 Project, considered stealth and better radar cross section, and has improved several lapses on the HDF-3000's design based on inputs from active duty Incheon-class frigates in the ROKN. 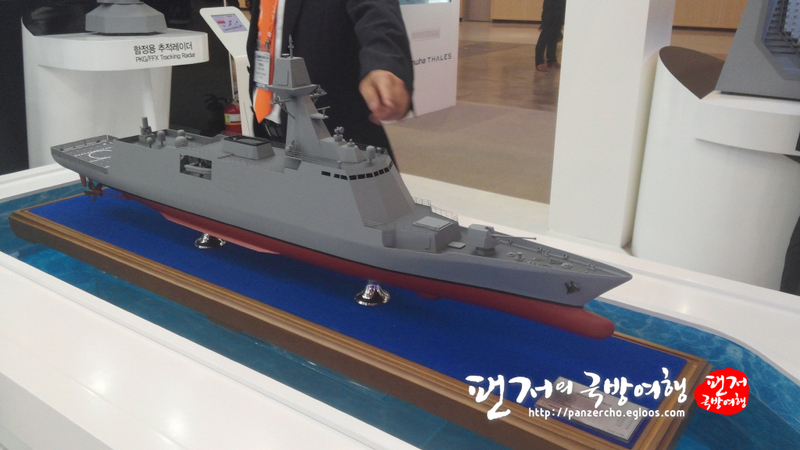 Hyundai Heavy Industries recently released their FFX-3 Frigate offering, which is based on their HDF-3500 design. MaxDefense believes that slight design cues from HDF-3500 might be used for the Philippine Navy's future frigate. Photo owned and taken from Panzercho's website. MaxDefense's own interpretation of the resulting design of the Philippine Navy-spec'ed frigate would have a close physical dimension to the Incheon-class, but will be superficially different based on the considerations made, and may even take slight design cues from the HDF-3500 especially on stealth application. HDF-3000 (left) and HDF-3500 (right) side by side. The difference in design is very much visible despite HHI being the designer for both ships. An integration of both designs is what MaxDefense expects the PN frigate will possibly look. Photo owned and taken from Ambassador @ TheMess forums. While we are still doing our own interpretation of the possible physical design of the frigate, it is different in terms of weapons systems. MaxDefense, through its sources, has finally obtained the weapons fit-out for the Philippine Navy's future frigate, as offered by HHI based on the documents they submitted during the tender stage. 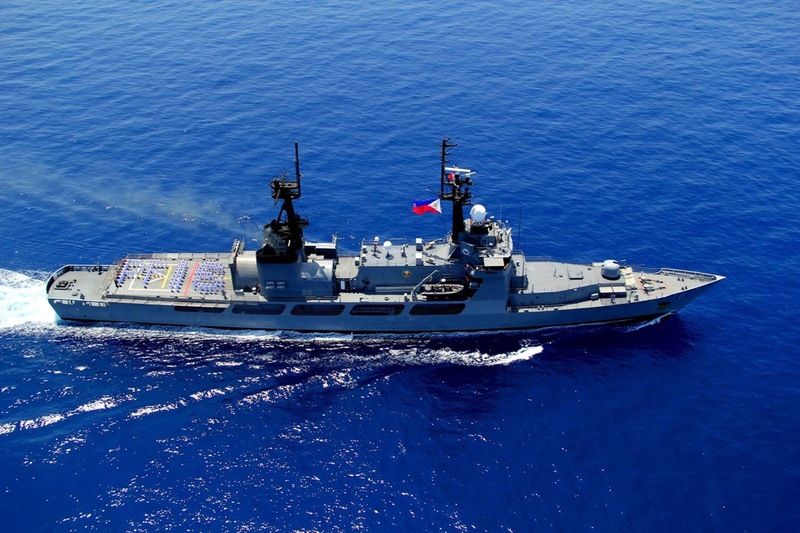 "The Philippine Navy's Frigate Acquisition Program Finally Moves in 2016! New Technical Specification Released and Tender Soon" - dated February 7, 2016, summarizes previous analysis and predictions made since 2013. This was the latest blog entry regarding the frigate prior to this. MaxDefense already posted before in the FB community page, that LIG Nex1's K745 Blue Shark lightweight torpedo was chosen by AgustaWestland's mother company Leonardo (formerly known as Finmeccanica) for the Philippine Navy's upcoming AW-159 Wildcat ASW naval helicopters. While the torpedoes ordered are for the helicopters, it should be noted that the technical specifications of both the Anti-Submarine Helicopter and Frigate Acquisition Projects mentioned that both platforms should have the same torpedoes for commonality, as the helicopter would be an integral part of the frigate. The K745 Blue Shark torpedoes, being the helicopter carried torpedo, is the practical choice to become the frigate's torpedoes too.The acquisition of torpedoes for the frigate is actually covered by the Lot 2 of the project, thus it is not HHI's responsibility to acquire them. According to our sources, Hyundai selected the UK-based company J+S Ltd., now under SEA Group, to supply the triple trainable lightweight torpedo launchers. 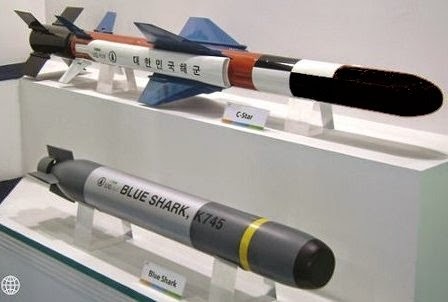 The launcher is capable of firing other similarly-sized torpedoes of different models, so the use of the K745 for the frigate is still open for debate even if practicality leans more on the Korean torpedo. SEA Group was selected by HHi to supply the PN future frigate's tripe trainable lightweight torpedo launcher. Photo taken from SEA Group's website. For the 76mm main gun requirement, MaxDefense's prediction was actually between Oto Melara's 76/62 Super Rapid gun, and Hyundai WIA's 76mm Naval Gun. Based on the Philippine Navy's specification that the gun should have at least 120 rounds per minute firing rate, the Oto Melara gun would be qualified, while the Hyundai WIA-made gun would fail as it can only do 100 rounds per minute. It was not mentioned if the guns will be using a stealth cupola, but MaxDefense believes Oto Melara would provide this as standard. It was specified by the PN that the frigate should have at least a single stabilised secondary gun with a gun calibre between 30mm to 40mm, Common sense says that shipbuilders are expected to provide only one stabilised secondary gun with the lowest allowable calibre to save on costs, so MaxDefense expected that a single 30mm gun will be provided, even if we hoped that there would be at least two guns, one each on both port and starboard sides. The MSI Defence Seahawk RCW is actually in service with the Philippine Navy's Jacinto-class patrol vessels (JCPV), and is expected to be easily absorbed into the logistics train. MaxDefense previously considered the possibility that Boeing's Harpoon Block II, MBDA's Exocet Block 3, LIG Nex1's SSM-700K Haeseong/C-Star, and India's BrahMos anti-ship missiles might be considered for the future frigates. Considerations for the Harpoon was due to possible American influence and compatibility, while the BrahMos was considered a possibility should GRSE use a local missile to allow foothold of Indian products. We also considered the Haeseong/C-Star should a Korean shipbuilder win in a similar reason as the BrahMos, while the Exocet has long been whispered as a favourite should shipbuilders opt to use French systems, especially the Indians which was reportedly using several French-made systems as reported by IHS Jane's in the past. While the requirement is only for two twin launchers, the LIG Nex1 C-Star launchers allows the conversion to quadruple launchers if opted by the PN in the future. Lot 1 of the Frigate Acquisition Project only include launchers for the missiles to be supplied by Hyundai, and the missiles themselves will be procured separately under the Lot 2 of the project. LIG Nex1's C-Star anti-ship missile (top) was confirmed to be used by HHI to fulfill the surface-to-surface missile requirement for the Philippine Navy's future frigate. The Philippine Navy requirement is for two trainable twin launchers for surface-to-air missiles with a 6 kilometer minimum effective range. MaxDefense predicted that offers may include the MBDA Mistral VSHORAD system mounted on a Simbad-RC remote trainable twin launcher, and the LIG Nex1 Chiron VSHORAD system mounted on a Korean-developed remote trainable twin launcher. It was expected both the Mistral-Simbad and the Chiron system could be included with any Korean shipbuilder's offer, while the Mistral-Simbad solution is seen as a choice for non-Korean bidders including GRSE. It appears that the Mistral-Simbad system was offered due to the Philippine Navy's insistence to use the system. It is unclear though if the Simbad system offered by Hyundai will be the RC variant. 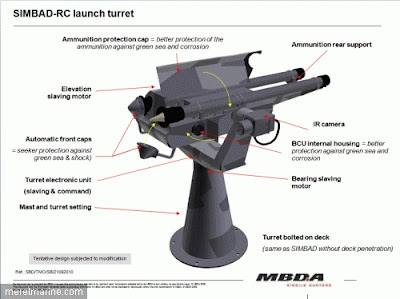 MBDA's Mistral-Simbad combo was said to be specifically preferred by the Philippine Navy, and HHI complied. This will become the ship's primary air defense weapon system until a VLS with longer-ranged anti-aircraft missiles are installed in the future. Photo taken from MBDA's website. Being a Fitted For But Not With (FFBNW) item, this is not part of the Frigate Acquisition Project, but will be acquired separately using a separate budget and separate project. 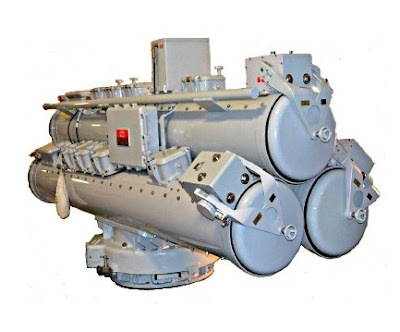 There were previous mentions by MaxDefense sources that the Philippine Navy is trying to negotiate for the possible acquisition of Phalanx 20mm CIWS from the US, but that remains to be seen later on. Although not included in the project, the latest technical specifications mentioned a specific dimension for the space sthat needs to be provided for a VLS by the shipbuilder. Due to sensitivity of the coverage of this section, MaxDefense will not be disclosing the sensors to be used by Hyundai Heavy Industries for its frigate offer. MaxDefense can only confirm for now that HHI already has a set of products it intends to use under this section. Instead, this section will be left open for future editing as the project progresses. MaxDefense readers are free to make their guesses on the comments section, or on a separate discussion which MaxDefense will open at the Facebook community page. While these are said to be what the shipbuilders submitted during the tender stage, it is NOT ALLOWED for Hyundai Heavy Industries to make some changes on its subsystem list, as whatever is in their submitted list must be followed by the shipbuilder during the construction phase, except if the Philippine Navy specify the changes with a valid reason, including the improvement of certain capabilities by replacing less capable subsystems. But definitely there should be no downgrading. Mention of this concern is pointed out as there is still a posibility that external pressure could intentionally or unintentionally push the Project Management Team to allow changes that are not just illegal, but could also be detrimental to the project, and to the end product. Should legally acceptable or unusual changes are made, MaxDefense will provide updates or criticisms as necessary during the course of the project phase. So When Do We See A Finalized Design? While the project is scheduled for contract signing very soon, MaxDefense reminds its readers that there is a schedule to be followed by HHI, and it is tied to the issuance of the Notice to Proceed, which is expected by MaxDefense to be released before the end of the year. Based on this, Hyundai is only expected to have a detailed design for approval by the 4th quarter of 2017, which is around a year from now. It means that we cannot expect a design showing what exactly the Philippine Navy future frigate will look like until late 2017. That's one year of patiently waiting just for the design! Construction completion and hand-over of the first frigate to the Philippine Navy is expected to happen before the end of 2019, while the second frigate is expected to be had by mid 2020. This is assuming no delays are encountered during the entire contract phase. So MaxDefense readers, we still have a long way to go! In the meantime, MaxDefense will regularly update you either here on the Facebook community page on the project's situation or if new information are available for public consumption. Patience is a virtue, and this is what is expected from you from now. For now, let's appreciate the current frigates of the Philippine Navy, including the upcoming BRP Andres Bonifacio which is on its way to the Philippines by November 2016. Photo of BRP Ramon Alcaraz from Philippine Navy PIO. First and well article Sir Max. Hi Sir max, I'm just wondering why DND was settled to Mistral Surface to Air missile? This is a very short range missile and should be the last layer of defense for the Ship for an effective range of 6kms? And its only Twin luncher, Why not 4 or 6 luncher? Reloading a twin luncher will take long reaction time to make this ready again. This is an interim solution while the PN is trying to fund the acquisition of a VLS system with a longer-ranged air defense system. I hope you dont mind if I share this to a popular Indian defence blog I frequent. They've got questions regarding the GRSE offer as well. We waited for almost 2 years for the FA50 too and it is now nearing the anniversary of its arrival. Buying brand new always take time that's why the AFP should not waste time on the procurement process prior to contracts. Does HHI's offer includes the design copyrights? Not really copyrights, but it would allow the PN to produce the ship under cooperation with Hyundai. The stealth requirement and vls alone would mean a cleaner/less cluttered superstructure. The space between the main gun,vls and superstructure also allowed the main gun to have a much improved line of fire than the hdf3000. I was expecting a gun/missile combo rcws for the vshorad. Would have been ideal to cover 360° against assymetric naval fastboat warfare. 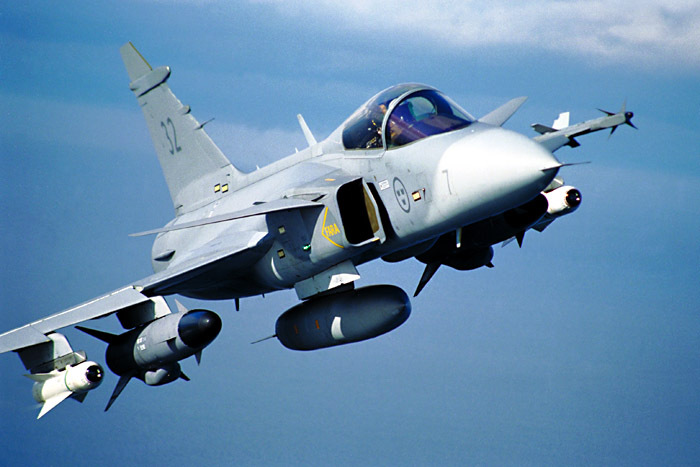 Is there a short range missile that can target air and surface? Anyway,if the ciws is phalanx, the gun/missile combo would have been redundant as newer phanlanx can target surface vessels. Searam would be the ideal ciws. Then the missile mounts could be dedicated to a spike er / gun mount or as retained redundant anti air def. Being not aimed to be an offensive frigate, a dual phalanx on both sides or anti sub munition. Similar to Swedish systems. I still believe the greatest threat in the open seas are subs. They offer an option for deniability when an accident do occur similar to North Korea's denial of the cheonan attack. I'm intrigued how to put up the secondary gun to maximize line of fire. Maybe high up on top of the hangar so that it got enough shoot down angle for closer targets. Too bad it's not the millennium gun as it can also shoot down both air and surface targets. As long as it can persistently defend itself, it would be a great platform. Surface vessels are not meant to be as effective as before as it is less survivable in today's naval warfare. It's now meant to be as persistent presence and influence projection. I do hope they upgrade the secondary gun to a gun/missile combo later on, as the MSI Seahawk can be modified to be mounted with missile launchers. With the PN already a future Spike-ER user, I expect the Spike to be used here too. CIWS is still a question mark although there were previous indications that the PN is interested in acquiring Phalanx, or better yet, SeaRAM. A counteroffer from the Koreans using refurbished Goalkeepers is possible too. we already got 2 mounts (assumed to be on both sides) for the vshorad. I would think there's no need to have another mount to allow for 2 secondary guns. We got plenty of mounts in the design. But i got your concerns, the secondary gun position is suspect. I would think that the rest of the weapons arrangement might rely heavily on the choice of CIWS. If SeaRam, we can use the 2 side mounts for missile/gun combo (2 secondary guns) - for surface or land targets. The secondary gun mount position on top of the hangar can be for future use (a vshorad, a phalanx or anti sub short range munitions). The requirement cues points to a phalanx CIWS. And that is what i think the planners have in mind. If our ciws is phalanx, yeah we need the 2 shorad mounts (but would be better if there's a gun/missile combo to cover 360) for air targets. The secondary gun is a concern for me. Our requirement is for the secondary gun to have 360 line of fire. The hdf3500 design have put the bridge 2 floors taller than the hangar roof to maintain usable space similar to hdf300. The choice for a SeaRAM would allow us greater flexibility to incorporate spike ER for both deep inland and surface targets, and/or a short range anti sub munition like a modern trainable sub grenade launchers. (with spike ER, we don't need the railgun or the expensive rocket assisted munition that's a temp alternative in the zumwalt). Imagine our frigate with a 100+kms range inland strike capability using spike ER. Having both phalanx and seaRam would be the ideal scenario. And depending on mission goal, the 2 side mounts allotted for vshorad can be for anti sub and/or spike ER/gun combo surface strike. I would frown on the goalkeeper. With a system having hull penetrations limits flexibility to change system later on and reduce usable space in the hull. Thats why I prefer the Spike for the gu -missile combo. This is to allow engagement range against fast moving surface targets like terrorist or suicide boats can be increased based on the missile's effective range. Sir will you attend ADAS? Unfortunately, no. But MaxDefense will be there as a media partner. Commonality with existing systems was considered. So far the PN already operates 5+1 of the Oto Melara 76mm gun, and adding another caliber could be a logistics problem. The Pohang, supposed to be the former ROKS Mokpo, is being renegotiated but its status is currently onhold. Since I don't have a fb page. I want to thank and commend the AFP for having now the political will to achieve this. May this continue for their own merit. Also to the people involved, what you have accomplished is a milestone and a first you're name is passed in the AFP history books for bringing our Armed Forces finally to the missile age. Finally would somebody drop a hollow block on tulfo's head because he deserved it. On the serious side, obviously the next step since we much needed such equipment like this is to follow our ASEAN neighbors by building their own warship at their own shipyards just like indonesia's sigma class frigates. I hope the samecwill be done to our country the Philippines. God bless. Finally! I thought this project was going down the drain. I hope the Shaldags and the SBMS would come out soonest. For the meantime sir max, is the DND not considering equiping the Del Pilars with missiles considering that it would still be 3 years from now that we would be getting our brand new missile-equipped frigate? It could happen, especially that the final fit-out of the frigate is already confirmed. Its only practical for PN to follow the fit-out of the frigate for the DPCF and all other ships in its inventory. That is the practical decision, but not on this case, hopefully. Sir, will the CIWS be included in Lot 2? And regarding the secondary gun, if indeed only one will be provided by HHI, will it be possible that PN will just provide for another secondary gun on the other side of the ship? Will it require major modifications on the ship? Lot 2 is for ammunition of the weapons systems included in Lot 1. So that includes the C-Star and Mistral missiles, torpedoes, and gun ammos. Until we do not see the final design, it's still not decided on where the secondary gun will be placed. It is still possible for the PN to opt and add another secondary gun especially that it was able to save Php 250 million from the ABC. As for the CIWS, all FFBNW items like CIWS, VLS and TASS would be a separate project, not under Lot 2. I see, I'm learning a lot from your blog. Thanks sir Max. Does the PN have preferrences for it SAM's? Yes, but I can't discuss it for now. The obvious choice is Mistral for VSHORAD given the launcher. As for the VLS I think the launcher indicates Mk. 41, although that could change due to it's a US missile and Mang Kanor doesn't want those. Great post Sir Max!! when will the Augustawestland deliver the Anti-sub Helicopters? after the construction of the frigates or it will be delivered ahead of the ships?? Reportedly 2018, almost a year before the 1st frigate. Force is not an option. It's not practical and not attainable in today's world. 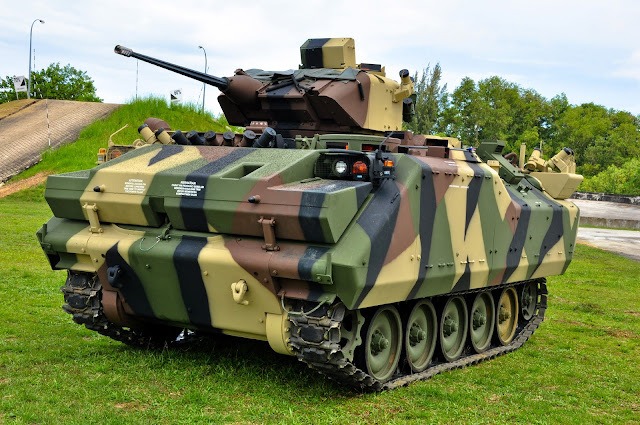 Nice,finally PN is stepping up the aquistion of frigates soon we may have 5-6 frigates,But DND and AFP should also aquire Light tanks or a MBT if possible,and also aquire new MLRS for our defense,we really need to step this up sooooo we can protect our territory and get respwct from our south east asian brothers. And we also need to get closer to Japan and S.korea even thou we are already close but we need to get closer and russia if possible?????? BUT NO TOOOO CHINA!!!!!! The Army has its own plans. But that depends on the support of the current administration. Sa wakas brand new talaga. It does not include expensive items like VLS, CIWS, ammunitions yet so eventually it would be higher. It would be no different from the Del Pilar ships except it will come with a handful of AS/ASW equipment and we all know that these Del Pilars will be stuck with their current weaponry throughout their entire service. FFBNW seems like a buzzword for "We're short and we can't afford it so we'll pretend we can purchase it at a later date". I'm bummed at the no CIWS, its a staple defensive tool for every modern ship nowadays. You did not get the point. It comes with launchers and guns that the GDP class doesn't have. All we need are the missiles and ammunition which will definitely push through. You are just trolling around here and does not really read what is in the contract. Nice tunay na brand new para sa bayan kong minamahal.thank you sir max for the imfo. Thank you Max as always for a well detailed blog. Mabuhay ang Hukbong Sandatahan ng Pilipinas! Yes lets appreciate the current Light Frigates by arming them with Harpoon Missiles and Light anti submarine Torpedoes. It won't be armed with Harpoons. The blog already explained that its going to be C-Star. its good news Sir max. Sir max as we enjoy the out come of aquiring new ships,any news about how true that fa50 is over? Its not over. The delivery for the 10 others will proceed. But further plans to acquire another 12 as indicated in the PAF's Flight Plan 2028 might need to be changed, as Pres. Duterte seems "allergic" with the FA-50. You may read my FB entry on this topic. Sir Max, what is the status of our Frigates since the NOA has been approved? This could be very beneficial both for the company and the nation. The technology when funded well results in good output and great results. HI Max, if duterte confirmed that US will not sell us missiles for FA50, what are the DNDs other option? Hmm.... Israel (the source of Spike ER) might be another alternative. But there will be systems integration concerns if this is so. Hope hindi ito ma kansela at palitan ng chinese made frigate... alam na... chinese made is very good for their eyes... bk pti fa-50 plitan n ng Nanchang CJ-6 at J-10/JF-17 para sa fighter role.. for dU30 china is the best country. instead of US and Allies in our side, he will choose China. Ive seen him speech in so many times, he is telling the truth from his heart all times if you observes him you can see the real goal of this man. Bad mouth is normal in him, but its not an alibi. he really don't like western country, he like Communism but he cannot force us easily. he was not miss understood. he is real at all time. he is good against drugs and worst in everything. he might be a stone to lift our country or a stone to destroy us. Nice Blog! Sir if the PN opted to use only one secondary gun is really nice to put it up the hangar bay for atleast 180°coverage? And as of the vshorad they should copy the design of sigma corvette that they put it on top of the bridge for better airdefense...by the way I would like what HHI will do for the design also. Are there any updates / progress on this ? So far seems no news from either the navy or HHI. Thanks. Is the design of Philippine Navy soon frigate is slightly like hdf-3500 design? hope this becomes a reality. Is it true it will will not have the TACTICOS?